There is no silver bullet to learning to play piano by ear. There is no quick fix. No magic pill, shortcut or ‘get rich quick’ pyramid scheme for learning to play by ear. It takes time to get good! The problem for most people is in sustaining a level of practise with their ear-training that isn't boring, too time-consuming or ineffective. So here are 3 simple ear-training activities that you can do ‘on-the-go’. Eat a yogurt as you sit on the commuter train, put your headphones on, do these exercises and all of a sudden you’ll find yourself on a completely different locomotive.. The EAR-TRAIN! No, I’m not encouraging you to wear yoga pants all week. This is something I go over thoroughly in the Ear Bootcamp ‘5 Days To A Better Musical Ear’. This is about listening to the same music you do normally, but listening to it on purpose. Actively listening. Is there a harmony to the melody at any point? Is there a bassline that you can also hum along with? What individual instruments can you identify? What qualities would you say there are to the song in terms of genre/style/mood? The simple act of focussing on these elements will shock your ear into actually paying attention! This is the start of your learning by ear journey! It starts when you choo-choose to tell your ears they no longer get a free ride on this train. You think you know what World music is? The style of music that is ethnic or indigenous with exotic instruments like djembes and sounds like it could have been made last century? This is about real world music… as in the music that we can find out in the real world. Spend an entire day, as you go about your normal activities, really listening to the world around you. Is there a bird, a cat, a fridge humming, the sound of a tap dripping, a computer buzzing, a blinking light fixture? There are noises around you all the time, and these noises are all at a frequency. Without recourse to radio, tapes, CDs, or television, I suddenly found myself aware of — no, listening to — a sort of secondhand music emanating from the machines and appliances nearby. My alarm clock woke me that morning, as it does every working day, on a distinctly musical note (B natural, to be precise). I shuffled sleepily to the refrigerator, which kept up a stoic hum (B-flat) as I reached into its guts for a frozen bagel. The bagel I subjected to the resolute drone (E) of the microwave, which concluded its efforts with a ding! (the B-flat an octave above the refrigerator hum) just as my teakettle began to whistle (A). Only those with perfect pitch can identify these notes without a reference point of an instrument or tuning fork, but we can at the very least try to notice these frequencies. Identify a sound and find the pitch of the sound by humming it out loud or in your head (this is called ‘inner hearing’). Record into your phone or tablet either the sound itself, or you humming the sound. (You can download a simple audio recording app for free). Once you get home and are sitting at your piano, play the pitch from your device and gradually play different keys to find the note your recorded pitch sits closest to. Get enough real world sounds together and make a melody out of the identified notes! Call it ‘Real World’, record it, get a sync deal and send me the royalties! These ear-training apps simply require a WIFI enabled device, a pair of headphones and yourself. What they say: Improve your aural skills and your music theory knowledge. Designed like a video game and with strong pedagogical concepts in mind, this app will make you truly master each interval, chord, scale, etc. before taking you to the next one. What I say: This app is different from the others actually has theory lessons in it too. What they say: Meludia makes use of gamification to maximize the music learning experience to cover melody, rhythm, intervals, chords and more. Meludia contains 700 exercises that will allow you to learn how to replay any melody in all music styles. What I say: Very aesthetically pleasing, it is so easy to navigate and admittedly addictive. I could lose several hours to this. What they say: Assists aural practice with over 180 mock questions each grade. It accurately analyses pitch and rhythm, and gives instant feedback, suggestions and explanations. What I say: Each app in the AuralBook series covers an ABRSM grade from 1 up to 8. So if you prefer to obtain the theory and ear-training of a particular grade, this is for you. It is of a basic design and the voiceover used is pretty laughable, but don’t let that hold you back. Three exciting ways to practice your ear-training while you’re on the go. Now you can be growing your ear skills without having to sacrifice your other activities or find extra minutes in the day, there’s no excuse! Get ear fit with my bootcamp! 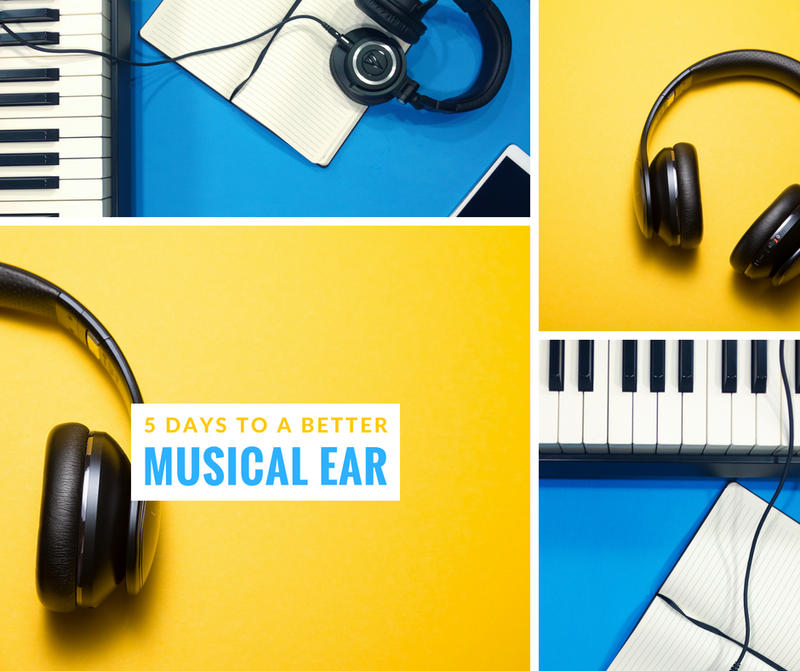 If you would like to join my popular ear bootcamp ‘5 DAYS TO A BETTER MUSICAL EAR’ all you need to do is click the below button and enter your email. It's completely and forever FREE! You’ll receive a confirmation email and invitation to join once the next bootcamp is coming round again, it’s that simple!